The art and practice of fly fishing as we know it evolved on the English chalkstreams, notably those in Hampshire and Wiltshire. Rivers with names like Avon, Test, and Itchen were the nursery for such master anglers as Marryat, Skues, Halford, Hills, Dunne, Wilson, Sawyer and Kite, to name just a few. These anglers were both formed and perfected by these demanding rivers, and their experiences formed the foundation of modern fly fishing. Thus, in the latter part of the 19th century, the two evolving schools of angling practice engaged in a debate whose echoes still ring today. Although not the only players in this great debate two names stand out above all the rest; Frederic Maurice Halford and George Edward MacKenzie Skues. Halford was born in 1844 and produced his first book, Floating Flies and How to Dress Them in 1886, a scholarly work that codified the dry fly method that had been quietly developing for over a half century. In the intervening years he authored no less than seven books until his death in 1914. Halford was a man of well ordered intelligence and strong opinions, and his influence led to many of the practices we still use today. Halford had two friends who greatly influenced his work; George Selwyn Marryat and Henry Hall. Marryat taught Halford the art of fly tying, they were close friends for many years and when he published Floating Flies and How to Dress Them he gave lavish praise to Marryat for his contributions. Many scholars credit Marryat with the idea of tying dry flies with paired upright wings, a technique normally believed to be Halford's. Marryat was a shadowy figure, and little is known about him outside of what Halford wrote about him. Unfortunately, Marryat died in 1896 during an epidemic. Historians can only speculate what more he might have contributed to fly fishing had his life not been cut short. Henry Hall was an engineer who, in 1879, perfected the complicated metallurgy, subtle forging techniques, and tapered eyes of modern fly-tying hooks. Halford wrote of the evolution of the forged, light-wire eyed hooks in his first book. He demonstrated that by eliminating the silk under wrappings and gut snell that a much lighter and more delicate fly could be constructed. Eyed flies could be fastened to tippets of various diameters to accommodate any type of water condition. This was a considerable advancement for the angler that was attempting to fool shy chalkstream trout. A neighbor of Marryat, W.G. Turle added another component to the development of dry fly angling, the Turle knot. This knot was perfectly suited for attaching a tapered eyed hook to a fine drawn gut tippet. It created a rigid connection for the fly, and it held the fly in a cocked position as it settled on the water. In 1889 Halford published, Dry-Fly Fishing in Theory and Practice, and much of what he wrote remains true today. In this book Halford and Marryat made several major leaps toward the development of modern dry fly angling techniques. The woven oiled-silk lines had been developed earlier in the century, but they were not quite satisfactory with Halford and Marryat. Working together and with several manufacturers they developed improved techniques for producing these lines and even developed the prototypes of modern double-tapered lines. The methods for producing and using these lines were carefully described in Dry Fly Fishing in Theory and Practice. 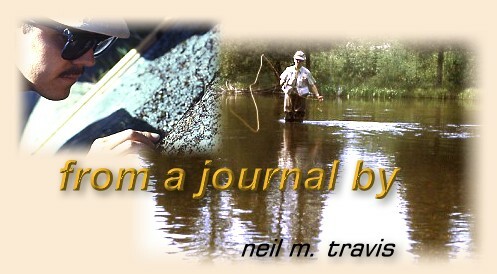 With the publication ofDry Fly Fishing in Theory and Practice the era of modern dry fly fishing was fully launched. Halford took over three hundred pages to set forth his ideas, and his chapters on dry fly theory and technique are still worth consideration by modern anglers. He gives lavish credit to Marryat, but clearly most of the book belongs to Halford. Dry-Fly Entomology was published in 1897, Modern Development of the Dry Fly in 1910, and The Dry-Fly Man's Handbook in 1913. Given the stature of the author these books were relatively disappointing, and it was during this latter period that Halford's disdain for wet-fly anglers became open hostility. Halford wanted the traditional wet-fly angler banned from the chalkstreams, particularly those anglers that used the blind fishing technique and did not cast the fly to a specific trout. He was particularly hostile to the nymph-fishing theories of Skues. Nymph fishing enraged Halford, and Skues publication of Minor Tactics of the Chalk Stream in 1910 brought the two men into a bitter confrontation. During the latter stages of his life Halford was completely committed to dry-fly purism, and he declared that chalkstreams belonged exclusively to dry-fly anglers. So great was his stature and influence that even today many club waters in England are restricted to dry-fly angling only. Halford died in 1914 leaving a legacy that still impacts fly fishing today. Despite his dogmatic adherence to the dry fly he was clearly the most outstanding angling author of his time. He established dry-fly fishing as we know it, and despite the advances in tackle and fly tying techniques the basic method that he described remains the same. Find a rising trout, cast accurately, and present you offering delicately. Despite his best efforts Halford was never able to banish the wet-fly angler. George Edward Mackenzie Skues, a famous attorney in London was a wet fly angler and was unwilling to buckle under to the dogmatic religion of the dry-fly purists. His first book, Minor Tactics of the Chalk Stream that so enraged Halford was based upon well reasoned logic, a commanding knowledge of angling literature, a sense of angling tradition, and much original thought. It was in the Flyfisher's Club in London where Halford, now advanced in years, challenged the younger Skues. "Young man," Halford retorted, "You cannot fish the Itchen in the manner you describe in your book." "But I have done it," Skues replied. The Way of a Trout with a Fly was first published in 1921, and expanded upon Skues theory of wet fly and nymph fishing techniques. This book was clearly Skues best work, and included a well written doctrine on imitating and fishing nymphal imitations, and his discussion about the purpose of hackles in fly dressing are worthy of consideration today.